What Are The Best Bank Accounts For Travelling In Asia? If you’re travelling abroad, and especially outside of Europe to the likes of Asia, it can be confusing to know which bank accounts to make use of. With the risk of steep card charges and accounts being blocked while travelling – it’s crucial you do the right kind of research before you set off to avoid any tricky financial blocks further down the line. Because let’s face it, travelling is a once in a lifetime experience that could easily take a turn for the worst should something such as your finances fall out of order. Asia, which includes amazingly stunning places like Thailand, Vietnam, Indonesia, Malaysia and Cambodia, is a true backpacker hotspot. Tens of thousands of tourists head South East every year to explore the continent’s beautiful offerings. But, with some heading out for months at a time, it’s fundamental that they have sound finances before making the trip. Good money management is crucial. Why Do You Need To Review Your Bank Account Before Travelling? It’s a good idea to have a dedicated bank account for when you head out travelling. It’s far more secure than carrying cash, and means you can track your finances in real time and manage your spending. But why can’t you just head out with your standard bank account and use it as normal while abroad, and especially in Asia? Well, for one – you can incur pretty steep charges if you opt to use your debit or credit card abroad. Even more so when travelling outside of Europe. This includes both withdrawal and transaction fees, so you can rack up an extra cost when taking out currency or just paying for something on your card. If you’re heading overseas for a longer period whilst travelling, this is something you’ll want to avoid. Do You Still Need To Tell Your Bank You’re Travelling Abroad? Another historic rule of thumb when travelling abroad was that you’d need to inform your bank or building society on your plans to head out of the country. Apparently, you no longer have to inform your bank when you’re abroad, whether that be on a short holiday or travelling for a longer period. However, many have reported stories of having cards blocked while in another country, which has left them without access to their finances and incurring steep call fees when trying to get the issue sorted too. So in short, it’s well worth setting up a dedicated bank account for travelling, especially in Asia, before you jet off. Monthly or annual service fees, the minimum balance required on opening, the exchange rate offered, mobile banking apps and transfer fees. You should also pick an account that makes sending and receiving international payments a breeze. What Are The Best Banks For Travelling To Asia? To avoid bank charges abroad, and to circumvent any frustrating card blocks before travelling to Asia, it’s a good idea to research some banks that are good for backpackers. Luckily for you, we’ve omitted the hard work, and have listed our suggestions below for the best banks for travelling to Asia in 2019. Credited as one of the biggest challenger banks, Starling is a prime choice bank account for backpackers. They don’t charge you to use your debit card, and like other providers, they maintain you don’t have to contact them before leaving the country. Unlike other banks and building societies though, if you do incur a problem during your travels – you can contact them directly through the app. TransferWise offers a ‘borderless account’ which allows you to operate in over 40 currencies in your account in the mid-market rate. It’s free to pay for goods overseas with the currencies you hold in your account, and you can also withdraw up to £200 a month fee free. Unlike most banks that’ll charge you a going rate for transactions and withdrawals overseas (and especially in Asia) – TransferWise won’t, and is, therefore, a sound choice for backpackers and travellers. If you’re looking for an abundance of cashpoints while travelling in Asia – then HSBC is the bank for you. In fact, HSBC was the first commercial bank in Thailand, which was established as far back as 1888. They charge a transaction fee, though, unlike Starling and TransferWise so it’s worth noting that to make use of the wealth of places to withdraw money, you’ll also incur a small fee. Another digital bank with an appeal to those travelling to Asia is Monzo. They offer free cash withdrawals up to the value of £200 a month. After that, it’s a 3% charge. Monzo bank accounts are quick and simple to open and are easy to maintain too – as you can do all of your banking through your mobile whilst on the go. For more on travel and finance, head here. Posted on March 8th, 2019 in Banking, Finance, Holidays, Travel. Posted on February 23rd, 2019 in Banking, Finance, Saving Money. Challenger Bank Accounts: What Are They, And Are They Worth Having? For as long as there have been banks, there have been established names in the industry of which everybody uses one or the other of. Halifax, Lloyds, Natwest and Santander are just a few of these big corporations, which when asked ‘which bank or building society are you with?’, will likely be your answer. But, as the term ‘challenger bank account’ has become more prevalent over the past few years – it’s time to question the possible benefits of these digital banking competitors, and whether you should be using them instead? The idea of app-based banking isn’t necessarily new, though. Just a few years ago, the big player in the online-only banking industry was PayPal. But now, names such as Starling and Monzo are hot on the tails of this corporate giant and are winning more and more customers from both PayPal itself, and the other ‘big four’ than perhaps initially expected. So, is what we’re seeing basically just a glorified PayPal? Well, no. The big difference between the two is that, although having many innovative features, PayPal is primarily a money transfer software tool only. Most business operations include the sending and requesting of money digitally, and individuals; between family and friends. Though you can pay for more and more with PayPal (including offline transactions), it doesn’t classify as a ‘bank’ as it does not possess all the features needed to be categorised as one. Challenger banks do. And (the clue’s in the name) they’re getting well up to speed with the UK’s most well-known businesses and hold the potential to even overrule them in the market. But what is a challenger bank account? Technically, the term challenger bank is used to describe any bank that’s looking to challenge the big four in Britain: Barclays, Lloyds Banking Group (which includes Halifax, Lloyds Bank and Bank of Scotland), HSBC and RBS (which includes NatWest and Ulster Bank). Established players, such as TSB, Virgin Money and Metro Bank, do actually fall into this bracket, but are not necessarily seen or known as ‘challenger banks’ as they’re pretty widely recognised already. The colloquial term has only recently come into play, and is largely used to describe banks that operate solely online – the two biggest names are ‘Starling’ and ‘Monzo’. These two UK challenger banks, amongst other names in their industry, focus on modern design, personalisation, low fees and convenient customer service to tempt people in. Tried and tested in real life by our team, to apply for a bank account with Starling, all you need to do is send over some details, a snapshot of ID and a very short video confirming that it is in fact you applying – and you’re done. No back and forth trips to the bank with lengthy meetings to get started. 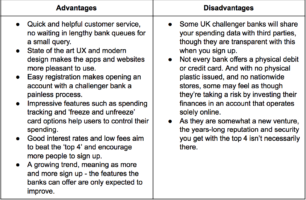 With e-banking and mobile banking at the forefront of their business, UK challenger banks like these operate solely online (even at the sign-up stage), setting them apart from their traditional competitors. They also feature real-time payment notifications, meaning you receive an alert every time there is any activity on your account. This, as credited by users of the challenger banks, makes it easier to keep track of your spending, but also helps you to instantly spot any anomalies – meaning preventing fraudulent activity is far easier. Is it worth opening a challenger bank? There are many reasons that more and more are choosing to open a bank with one of these nifty alternatives as opposed to the big players, mainly because of how easy they are to use. With real-time control over your spending, impressive user experience and there-when-you-need-it customer service, these challenger banks play on the frustrations that customers have with the ‘top 4’ and use them to their advantage. But, as with anything, there are always drawbacks to bog down the positives. And challenger banks, though largely popular now more than ever, are not free from ‘cons’ either. To help you decide whether they’d be right for you, we’ve put together a quick table of advantages and disadvantages to help steer your decision. As with anything, there are certain ‘pros’ and ‘cons’ to challenger banks, so your decision depends on what you want out of a bank. If you’re open to new ideas and like the thought of managing your finances online, then the likes of Monzo or Starling will certainly offer you an abundance of helpful features in exchange for you opening an account with them. But on the flip side, if you prefer the security of a traditional and reputable bank, then you may be better off keeping your money where it is. Do you have an account with a challenger bank, or are you considering opening one? We’d love to hear your thoughts. Tweet us at @moneybright, or with the hashtag #MoneyBrightAdvice and let us know today. Posted on January 24th, 2019 in Banking, Finance. Control your overdraft rather than it control you! With news that the Financial Conduct Authority have slammed the banks’ approach to overdraft charges to customers, we look at ways in which you can take control of your overdraft – rather than it control you. Posted on August 7th, 2017 in Banking. Thanks to the rise of smartphones, there is a plethora of moneysaving apps available to download. Each app promises a new way of handling money, saving and reducing the amount of superfluous spending on things like clothing and takeaway coffees. Posted on June 27th, 2017 in Banking, Family. Posted on June 27th, 2017 in Banking, Money Saving.